The Northern Territory (NT) can be divided into two regions: the tropical Top End and the desert Red Centre. Darwin is the NT’s capital city and is the entry point to many attractions in the Top End. The NT is an excellent option for students seeking a relaxed, outdoor lifestyle and a warm climate, with Darwin being Australia’s only tropical capital city. Darwin’s multicultural atmosphere and proximity to Asia (and the rest of the world, for that matter) as Australia’s most northern capital city makes it an attractive option for international students. Students in Darwin can relax at the city’s tropical gardens and beaches, watch a movie at the outdoor Deckchair Cinema or visit one of the restaurants and nightclubs on Mitchell Street. Litchfield National Park, two hours south-west of Darwin, offers scenic walks, swimming holes, picnic areas and other natural attractions. There are also camping grounds so you can enjoy a longer stay and explore the whole park. Heading down towards Central Australia, you pass through Katherine, the gateway to Katherine Gorge — a spectacular setting featuring a large river with rugged cliff walls on each side. 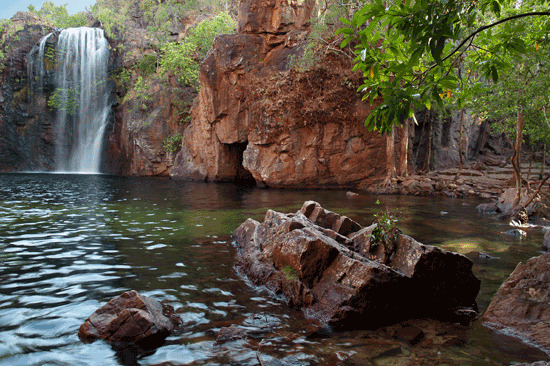 The World Heritage listed Kakadu National Park is another popular attraction in the NT. Covering around 20,000 square kilometres, this park is world famous for the beauty of its scenery and the amazing variety of wildlife it supports, including crocodiles. Kakadu also hosts a supreme collection of Indigenous rock art — some of it dating back 30,000 years. The paintings constitute one of the oldest historical records of any group of people in the world. South of Darwin is the desert and the iconic outback city of Alice Springs. Set among a striking red desert landscape, the town offers plenty of opportunities for adventure activities, trekking and viewing the Aboriginal art of the region. Alice Springs is also a good base from which to explore the unique scenery of Central Australia. Attractions include the well-known Indigenous sacred site Uluru and the spectacular rock dome formations of Kata Tjuta (also known as The Olgas). Uluru and Kata Tjuta are the remains of erosion that began around 500 million years ago. For further information, see the Travel NT website. The range of education providers in the NT is small, but the territory has a good selection of courses in general areas such as teaching, law, business and nursing, as well as expertise in areas specific to the Northern Territory, such as desert science and Indigenous studies. Most students are located in Darwin. International students make up nine per cent of the NT's total student population. The median weekly rental price for a house in Darwin is AUD$500, while the median weekly rental price for a unit is $400. The NT offers discounted or free bus travel to all students. Buses run frequently around Darwin in peak times, but are less frequent at night and on weekends. Transport in other areas of the NT is limited, so access to a car or other form of transport may be required. For more information about public transport and fares, see the Northern Territory Department of Transport website. Darwin has a tropical climate with distinct wet and dry seasons. The average maximum temperature in Darwin is in the low 30s all year round, while further south the winter maximum drops to around 20°C.